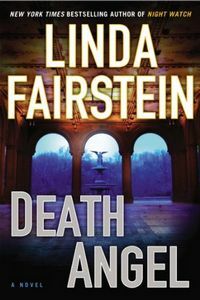 Death Angel by Linda Fairstein, a Mysterious Review. Review: After the body of a young woman is found in Central Park, Assistant District Attorney Alexandra Cooper has far more questions than answers — Who is she? How did she get here? and What, if anything, do the century-old artifacts found nearby have to do with her murder? — in Death Angel, the 15th mystery in this series by Linda Fairstein. The lead detectives on the case learn that a black man, who has KILL COOP tattooed on his fingers, has recently been sighted in the park exposing himself, and focus their attention on him as the likely suspect in the murder. But Alex is having a hard time reconciling him with her unanswered questions. The woman was clearly killed somewhere else and her body moved to a popular area of the park. How could he, or anyone for that matter, have accomplished this with no one noticing? And the artifacts, if they are relevant and she believes they are, suggest someone with an appreciation of the history of the park. Their investigation leads them to the nearby Dakota, where an elderly woman still remembers the day from the 1970s when her granddaughter went missing, a crime that garnered national attention but one that was never solved. There are a number of compelling elements to Death Angel, in which Central Park plays a key role in the story. The mystery storyline is an intriguing one, but there's a sense that the author is more or less on auto-pilot here; the story lacks emotion and depth — and direction. It is apparent that a lot of research went in to writing the background material, all of which seems to come out at one point or another. A little detail here and there to give a sense of perspective would have been ideal; instead there is so much information that it comes across as almost encyclopedic and, to be sure, mere filler. History buffs and residents of Manhattan will likely find it fascinating. But for everyone else, it's a bit overwhelming. And that's especially unfortunate since there is actually so much going on separate from the investigation itself, some of it interesting and relevant, much of it, however, rather tangential. Death Angel isn't a poor entry in this long-running series by any means, but it also isn't among the better ones either, and will probably appeal most to fans of the series as a whole. Acknowledgment: Penguin Group provided a copy of Death Angel for this review.